“Strategic patience” is not a substitute for strategy. Since the March 2011 outbreak of the Syrian Civil War the U.S. has been exercising “strategic patience” with regard to Syria, standing on the sidelines waiting, for “what” it’s difficult to say, as over 100,000 innocent civilians including more than 10,000 children have been killed in the fighting. Similarly, the United Nations Educational, Scientific, and Cultural Organization (UNESCO) and, by association the U.N. itself, has again revealed its weakness in effectively encouraging the protection of global citizens and world heritage sites at risk. ISIS has exacted these human tolls and laid waste to the architecture of Palmyra just as the Taliban did to Afghans and the Buddhas of Bamiyan (Afghanistan) in 2001. 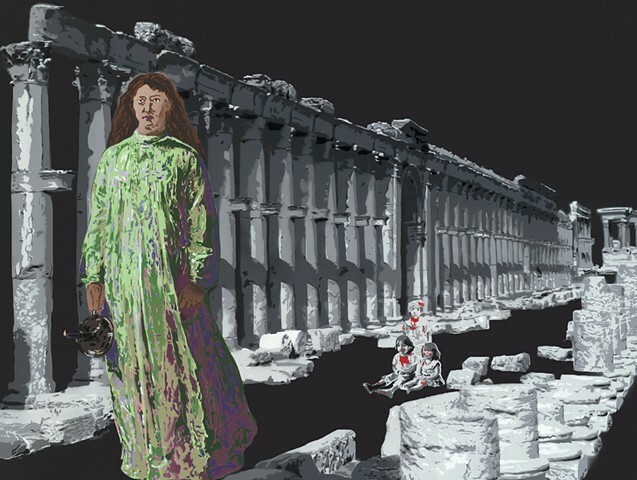 These policy failures are captured in this artwork – the former through the images of wounded Syrian children and the latter through the damaged grand colonnade of Palmyra. The primary figure in the artwork was appropriated from The Somnambulist (Sleepwalker) by John Everett Millais (1871), an apropos figure to symbolize the role (not) being played by the U.S. and U.N. in this Syrian crisis.